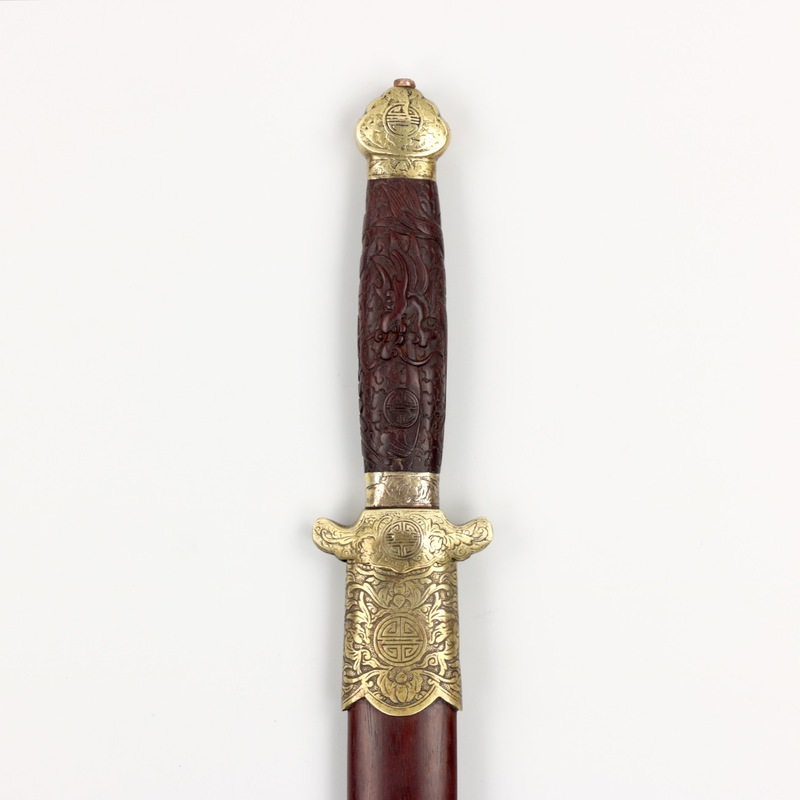 Other than the swords of village militia who used heavy, utilitarian swords, the scholar's swords were generally of higher quality but lighter and more delicate. They were not made for full-scale battle, but rather as status symbols that could serve in the occasional act of self-defence or duel. For an introduction on the state exams of China, see: Beverley Jackson and David Hugus: Ladder to the clouds : intrigue and tradition in Chinese rank , Ten Speed Press, Berkeley, California, 1999. A very thorough study of the subject from Yuan to Ming dynasties: Elman, Benjamin A.: Cultural History of Civil Examinations in Late Imperial China University of California Press, 2000. 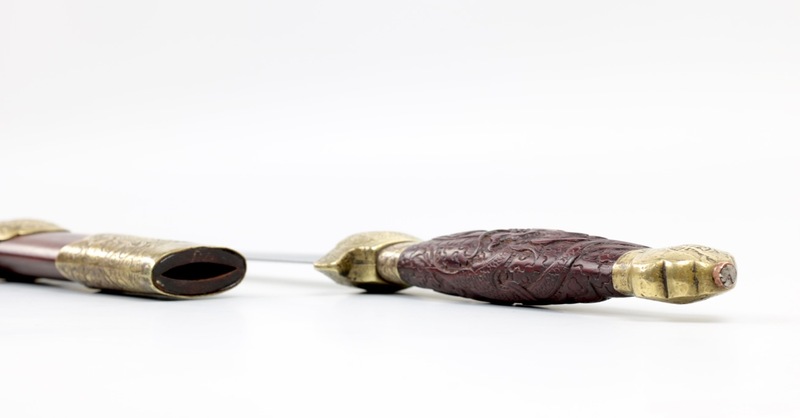 Dating: Possibly 18th century blade, 19th century brass mountings, recent handle and scabbard. 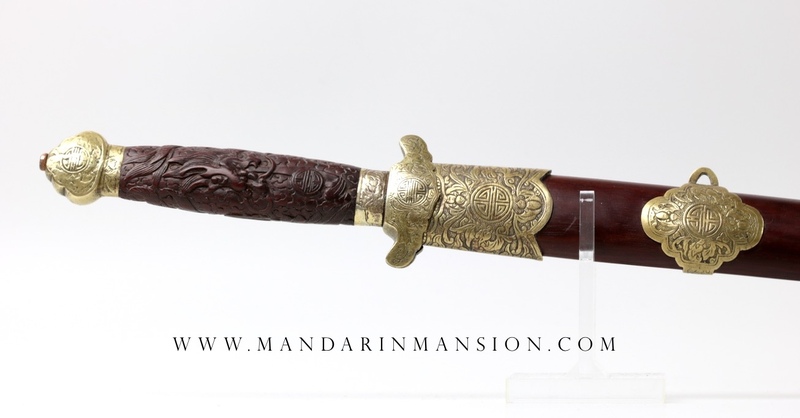 A Chinese straightsword with a superb early blade of flattened diamond cross-section and precise geometry with prominent center ridge. 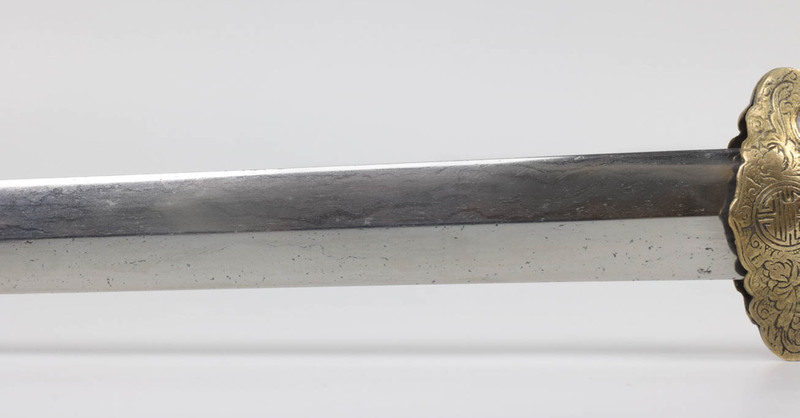 The blade is of sanmei construction with a high carbon steel edge plate sandwiched between many layers of milder forge folded iron and steel. 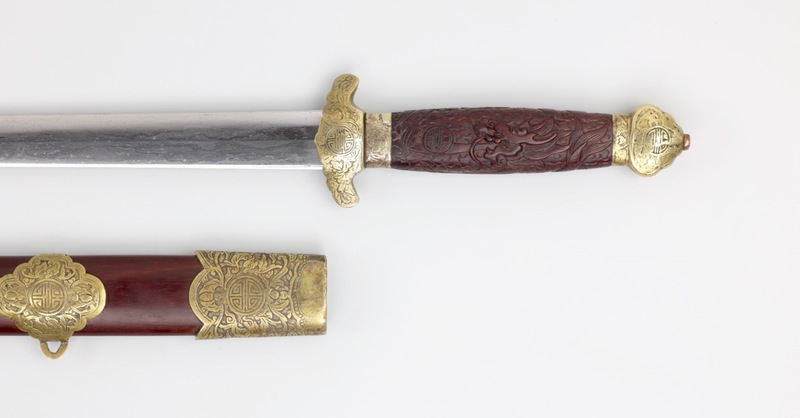 The result is a very stiff and rigid blade, resilient but capable of taking and holding a very sharp edge. 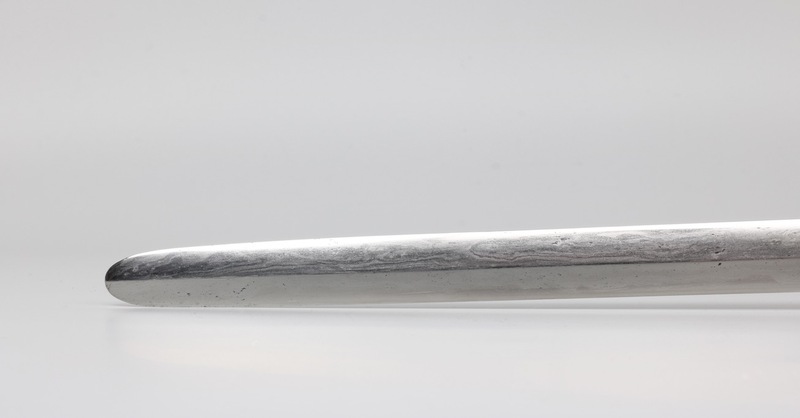 Blade profile with considerable taper in width from base to tip, a hallmark of early work. 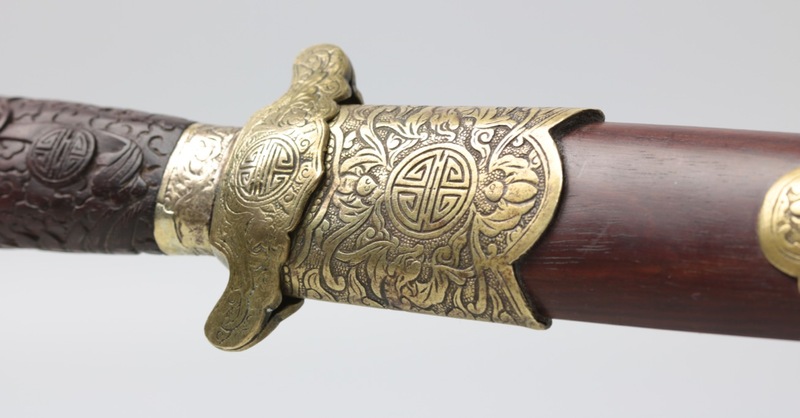 In the Ming, such swords were typically forged with a very fine and dense pattern that almost looked like homogenous steel, while during the Qing forge folded wood grained patterns were seen more. 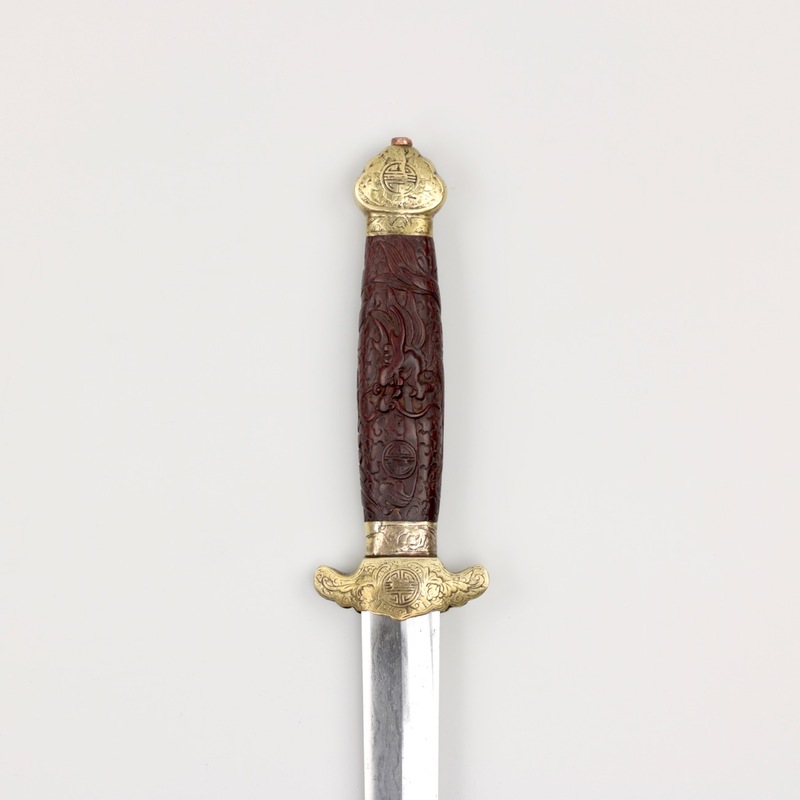 I therefore estimate the sword to be of the 17th or 18th century. Blade is in bright polish, revealing the details of its steel construction in just the right light. Blade is in near perfect condition; only some minor pitting, no nicks or cracks. 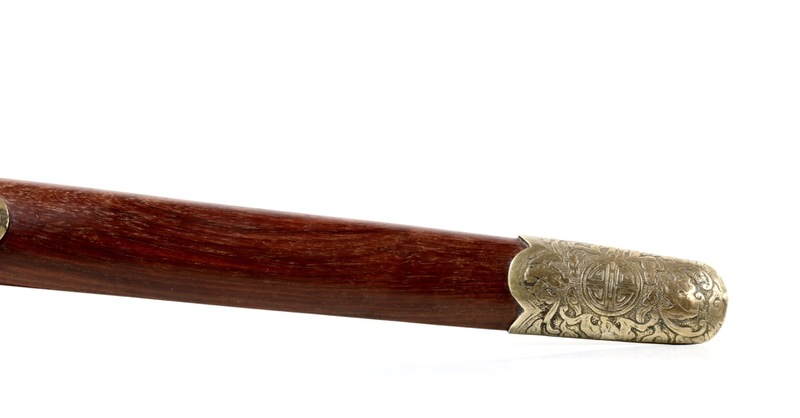 The fine blade comes mounted in a complete set of 19th century brass fittings. All fittings decorated with bats around stylized longevity characters shou (壽). 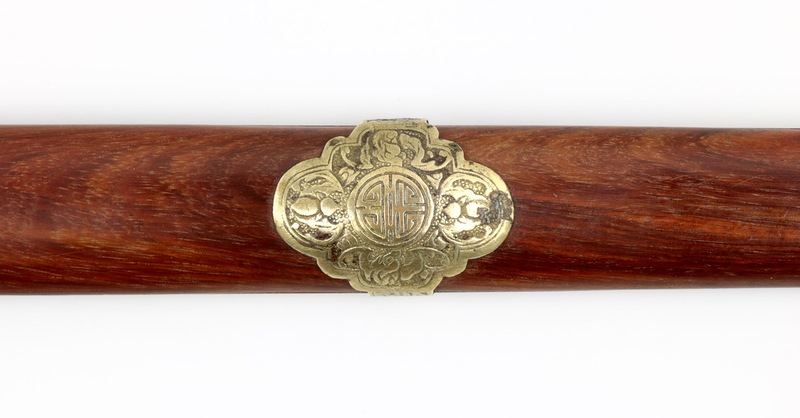 The word for bat is pronounced fu in Chinese, which sounds exactly the pronunciation of 福 which means: blessing; happiness; good fortune; prosperity. Together these elements make the pun fushou ( (福壽) or "a long and blessed life". Some wear and minor repairs to the fittings but overall in good condition. See pictures. 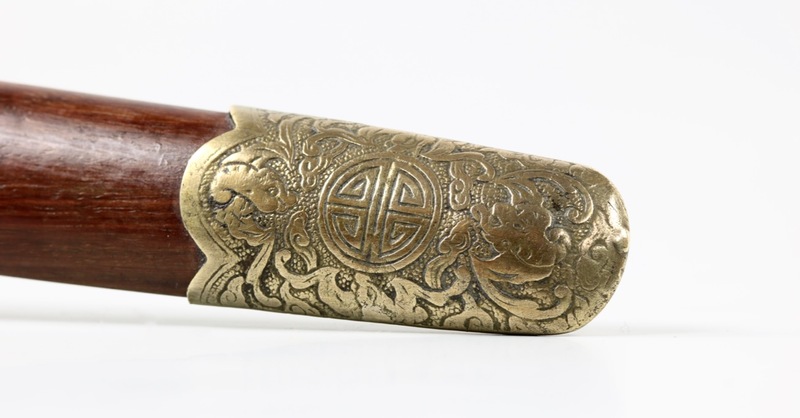 The newly made handle is carved with designs of dragons, and it repeats the longevity symbols on the fittings. 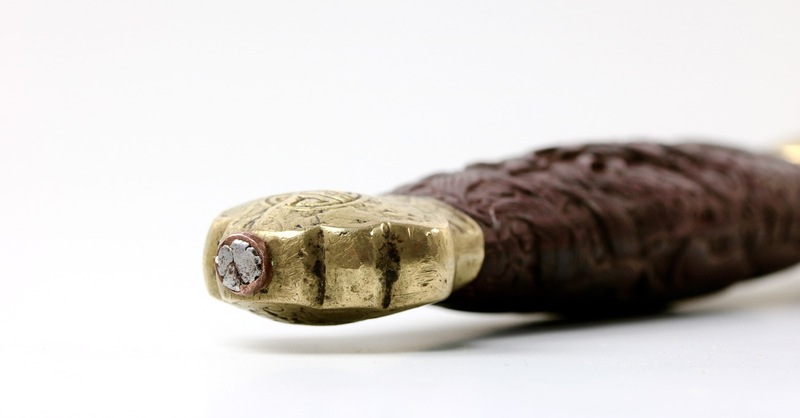 The carving is nicely done. 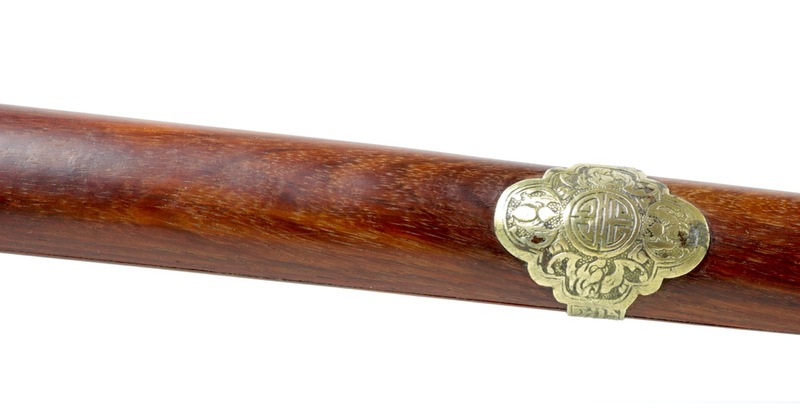 The scabbard is made of precious huanghuali wood with a beautiful, deep luster. 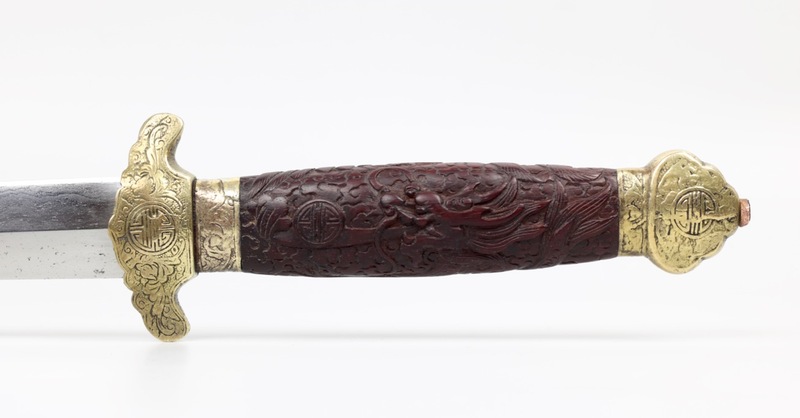 This work is typical for a group of Chinese jian refurbished and sold by Alex Huangfu about a decade ago. 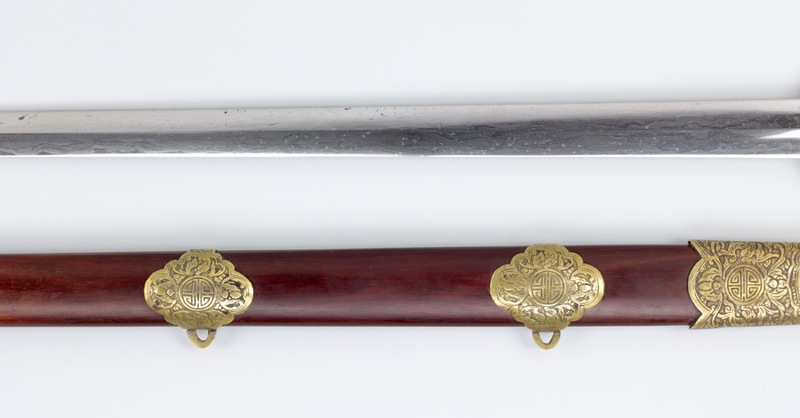 The sword has excellent handling characteristics, and due to its length and fairly forward balance feels a lot more mature than the numbers would suggest. 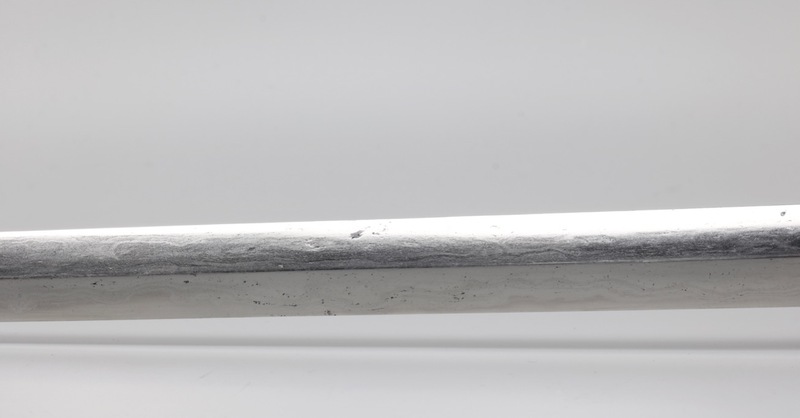 A nice weight and for everyday practice. 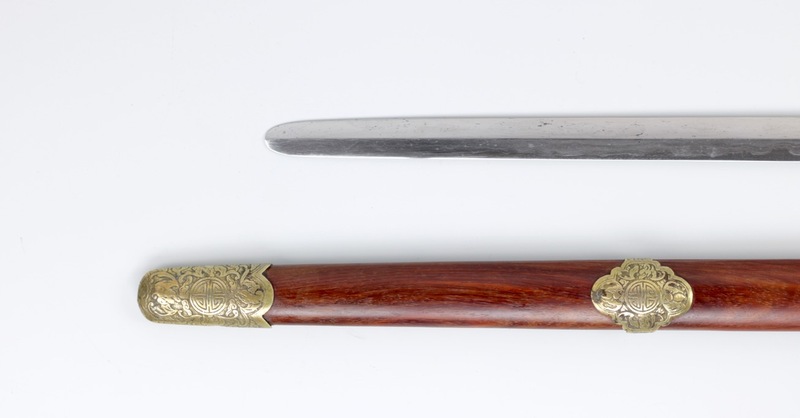 A fine Chinese straightsword with suberb blade, in excellent condition. 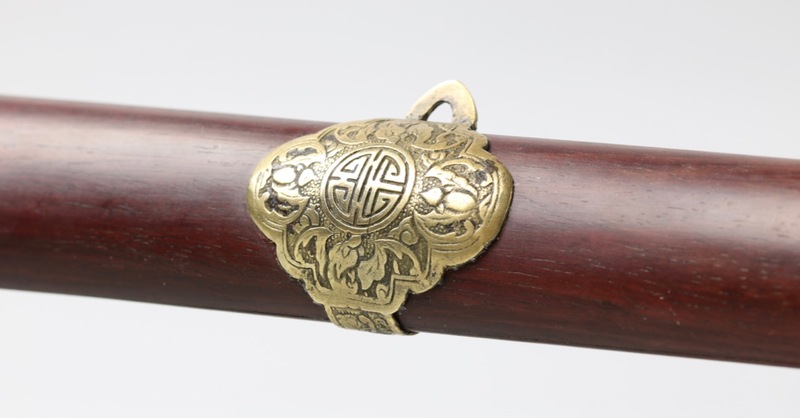 Mounted in a complete set of 19th century fittings of the "fushou" type, with bats and stylized longevity symbols. 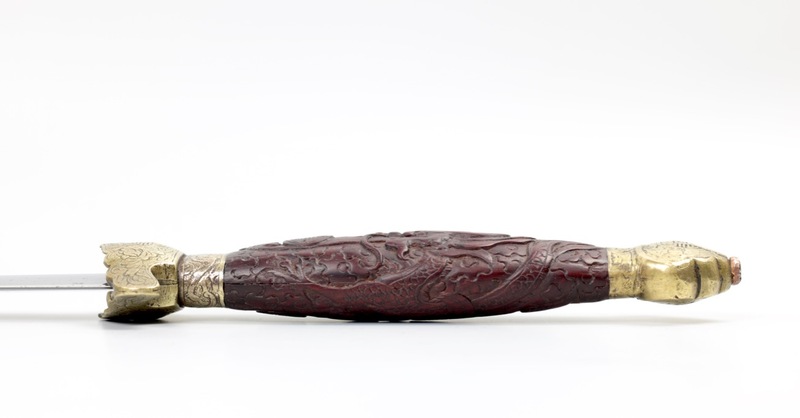 Handle and scabbard were part of a restoration about a decade ago, all skilfully done with high quality materials.